"You're in a very tough situation, José." 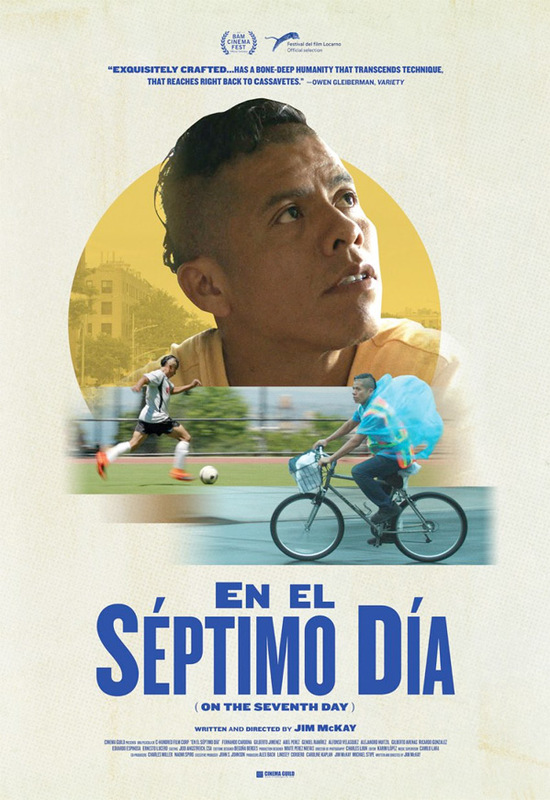 Cinema Guild has debuted an official trailer for an indie drama film titled En El Séptimo Día, which translates to On the Seventh Day. The latest film by Jim McKay, this indie drama is a compelling look at immigrants in America and the work they do for us. The film follows a group of undocumented Mexican immigrants who work long hours six days a week, and then savor their day of rest on Sundays on the soccer fields of Brooklyn. It has been described in reviews as "an ode to those who fight for that glimmer of hope this country claims," giving us a look at the lives of these immigrants and how hard they work for the chance to have the most basic lives, with their brief freedom to play soccer bringing them the most joy. Fernando Cardona stars as José. This film looks like it might be a good one to watch. Bicycle delivery guys, construction workers, dishwashers, deli workers, and cotton candy vendors, they work long hours six days a week and then savor their day of rest on Sundays on the soccer fields of Sunset Park. José, a bicycle delivery worker, is the team’s captain – young, talented, hardworking and responsible. When José’s team makes it to the finals, he and his teammates are thrilled. But his boss throws a wrench into the celebration when he tells José he has to work on Sunday, the day of the finals. José tries to reason with his boss or replace himself, but his efforts fail. If he doesn’t work on Sunday, his job and his future will be on the line. But if he doesn’t stand up for himself and his teammates, his dignity will be crushed. En El Séptimo Día (On the Seventh Day) is directed by veteran American filmmaker Jim McKay, director of the films Girls Town, Our Song, and Everyday People previously, as well as lots of TV work. The film first premiered at the BAMcinemaFest and Locarno Film Festival last year. Cinema Guild will release McKay's En El Séptimo Día in select theaters starting on June 8th this summer. Who's interested?